In this article, I will review some important insights on cloud computing. In order to achieve the most from this article, we need first to understand the cloud-computing concept, and how the cloud is different from any other infrastructure. Cloud computing is the result of one of the biggest and most important revolutions we’ve witnessed in the software industry, the technology known as virtualization that has changed how organizations around the world manage their computing resources. This advanced technology creates a completely new methodology of how organizations can share computer resources across multiple systems in order to reduce costs and deployment time, increase scalability, and facilitate the IT department in managing their infrastructure. The virtualization technology becomes even more important once evolved in the new form of cloud computing. Cloud computing is an internet-based platform that uses the virtualization technology and its various computing services like hardware, software and any other computer-related services that provide a total solution of resources based on demand across the internet. Enables companies/people to consume on-demand resources, such as a virtual machine, storage, and applications. This is the fundamental layer of the cloud solution. It focuses on physical resources such as computing services, networking, and data storage space. IaaS resources are usually billed on-demand based on customer usage. This is the second layer of the cloud solution, which provides organizations with a platform with the main advantage of removing their need to manage the underlying infrastructure. An organization that uses this layer will not need to worry about resource procurement, capacity planning (you can simply set it to grow dynamically as long as you have the budget) and the maintenance of both hardware and software. 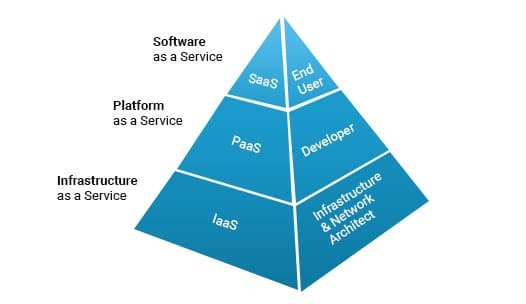 The top and the most cost-effective layer of the cloud platform, which provides a complete product, is often referred to as an end-user application, run and managed by the service provider. In this layer, applications are available to the end users on demand via the internet. Using SaaS, a customer can access their applications without installing the software on a personal device (workstation/server). The entire processing effort is conducted on the vendor’s datacenter. There are three types of available cloud formations: public, private and hybrid. Mixture of both public and private clouds. The mixture depends on the organization's decision on what services to expose to all and what services they want to expose to specific users. You get the Basic setup but still, the knowledge of the subject is required. Customers do Not need to worry about technicalities; The SaaS provider company handles everything. Interoperability – A universal set of standards and/or interfaces have not yet been defined, resulting in a significant risk of vendor lock-in. Latency – All access to the cloud is done via the internet, introducing latency into every communication between the user and the provider. Regulations – There are concerns in the cloud computing community over jurisdiction, data protection, fair information practices, and international data transfer—mainly for organizations that manage sensitive data. Reliability – Many existing cloud infrastructures leverage commodity hardware that is known to fail unexpectedly. Resource control – The amount of control that the user has over the cloud provider and its resources varies greatly between providers. Security – The main concern is data privacy: users do not have control or knowledge of where their data is being stored. Cloud testing refers to testing of cloud resources (both hardware and software) that are available on demand. Cloud testing must be conducted to ensure that the product under test meets both its functional and non-functional requirements. Requirements - Gathering and prioritizing business needs/stories by the customer/PO for the product as well as capturing them in a central location. Design - Building a technical blueprint of how the proposed system/feature/model will work. It includes elements such as system features, models, technical architecture, integration points, interfaces, UX, etc. Development - This is the physical building and coding of the product’s features/model including database based on the design and requirements. Testing - Verifying the feature/component of a product works as expected and meets all of the business requirements. It also includes writing test conditions and executing test scenarios. Go-live & maintenance - Implementing the feature/component of the product in the production environment as well as the day to day maintenance of the application (including updates). 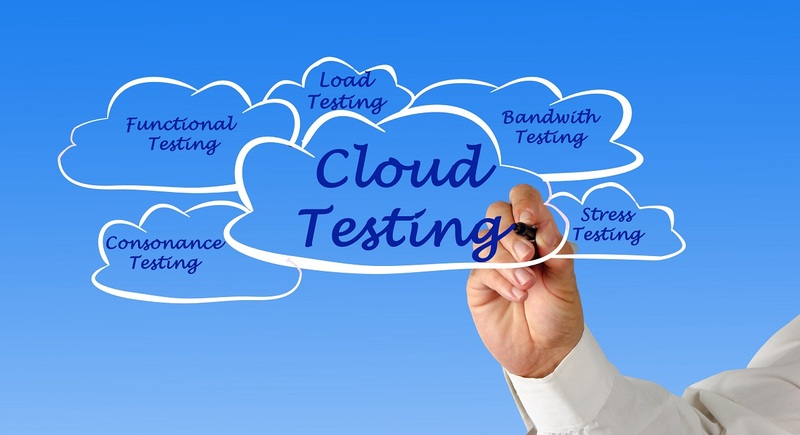 There are four different types of cloud-based testing. Each type has its own objectives. Testing SaaS in a cloud (testing an application) - This type of testing is used to validate the quality of the application in the cloud. Functional and non-functional requirements of the particular application are verified. Testing of a cloud - The cloud is tested as a whole entity and based on its functionality. This type of testing is used to validate the quality of the cloud from an external (end users) point of view (its capabilities and service features). Testing inside a cloud (infrastructure testing) - This type of testing is carried out by the cloud vendor and checks the quality of a cloud from an internal view or feature, based on the internal infrastructure and capabilities of the cloud (e.g. automatic capabilities, security, management, monitoring). Testing across clouds (services testing) - Testing an application is done over various clouds (private, public, and hybrid). It is based on application service requirements. A test lab that simulates a cloud-based environment, where the application is deployed and tested. A hybrid, public or private environment, where the application is deployed and tested as it will be available for the customers. Quality control - How do we maintain quality products in an area that demands fast, high turnover of deliverables with no bugs? This is the world of cloud, which can be very complex for those who do not invest the time to learn it. Data security and privacy - One of the biggest advantages of cloud infrastructure is multi-tenancy support. Although multi-tenancy support is great, there is still a major challenge to ensure that the customer’s data is not compromised, security standards are applied and the privacy-related regulations are enforced. Upgrades with a short notice period - Cloud providers give existing customers a very short notice prior to upgrades. This is a big problem when manually validating changes to your SaaS application and is another major consideration when thinking about conducting manual testing in cloud projects. Data migration - Data migration, the process of moving customer data from one cloud provider to another. During this process, the risk increases dramatically because both providers involved must ensure that the data is migrated without losing any critical data. Upgrade testing - Cloud testing’s biggest challenge is to ensure live upgrades do not influence the existing connected cloud users. Think about a multi-tenant environment that uses the same cloud environment, when the application is upgraded for a specific customer. Sound simple? Unfortunately, in some cases, the upgrade process may influence the user experience of the other tenants due to latency, networking issues, and their shared resources. Bugs - Bugs are no longer isolated; once seen they can be seen by all and exploited. Frequent releases - Frequent releases provide less time to run tests, less time for regressions and as a result more unexpected defects and higher risks. Lower costs, payment per use of the cloud services. Testing is done in the vendor’s cloud-based configuration. Performed on both real-time and virtual online test data. Disaster recovery (DR) testing – The cloud as a service must be available to customers at all time, therefore, it’s important that a replicated site will be available in case of critical failure. While executing DR tests, the team must ensure that the app can recover in case of a massive failure(restore to the last available point, no loss of data, minimum downtime, etc.). Availability testing – This type of test is usually owned by the cloud vendor that ensures that the cloud is available to customers at all time without any downtime. Capacity testing – This verifies that current and future hardware supports expected usage as determined by the specification of the product (such as adding or removing resources to or from a customer). Multi-tenancy testing – This type of testing is very important in any cloud-testing strategy. During these tests, the cloud services are tested by multiple users from different tenants (each service can serve multiple customers). Testing must be performed to guarantee there are no security incidents such as access (control or data leaks) and that there is no degradation in performance once multiple customers access the same service. Functional testing - This tests the app delivers the required functionality. Reliability testing – To ensure that the app is capable of performing failure-free for a specific period of time in a specific environment. Security testing – As discussed earlier, the cloud environment provides access to multiple customers who can use the same services. As a result, we must ensure that there is no unauthorized access to the data within the SaaP application, no privacy leaks, and that customer data integrity is kept under strict security gates. Scalability testing – Cloud services are relevant to both small and large organizations; as a result, there must be tests to ensure that the business can scale up or down its resources based on the customer’s need. Load and stress testing – To identify the stability of the system beyond its operational capacity to see how it reacts to different loads. Live upgrade testing – To ensure that we can deploy new versions on the cloud without affecting customers’ user experience. Performance testing – To ensure that the SaaS application can manage different traffic loads that depend on the number of customer requests. The main factors that we want to validate in this type of tests are network latency, the response time of the application and the workload balancing (NLB) in case of massive use.